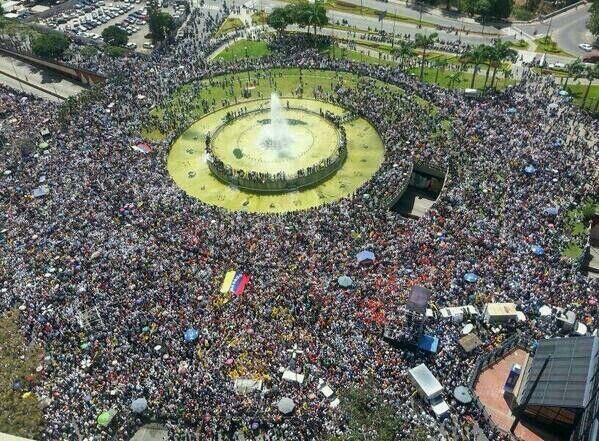 Three people were killed today in massive student protests against the Marxist Maduro regime in Venezuela. Students were seen carrying a dead brother away from the violence. Venezuelan President Nicolas Maduro’s government on Thursday sought the arrest of a leading opposition figure and other political adversaries, accusing them of orchestrating an antigovernment demonstration that left three people dead Wednesday. Mr. Maduro, whose 10 months in office have been marked by protests and a quickly deteriorating economy, blamed “neofascists” financed by the U.S. for clashes that resulted in the shooting deaths of two protesters Wednesday afternoon in the heart of Caracas. A third victim was fatally wounded in an affluent eastern district of the capital by what local officials called roaming gangs who were shooting at residents after nightfall. An arrest warrant, widely reported by local media, was issued by the government against opposition leader Leopoldo Lopez for crimes ranging from homicide and terrorism to damaging public property, public intimidation and setting fire to a public building. The government also sought to arrest Ivan Carratú, a former high-ranking naval officer, and a former Venezuelan ambassador to Colombia, Fernando Gerbasi. Mr. Maduro said Mr. Carratú and Mr. Gerbasi were recorded earlier as predicting the protests would end in bloodshed. The people are angry about shortages of basic goods and the government’s efforts to deepen its intervention in the economy and corral the press, Mr. Lopez had said before the demonstration. Efforts to reach Mr. Lopez, Mr. Carratú and Mr. Gerbasi were unsuccessful. But Mr. Lopez, speaking to reporters on Wednesday night after the protests, said that it was the government that was “fomenting paramilitary groups and armed groups in the cities.” He said that the violence reflected the weak nature of a government that has been unable to deal with rampant crime, widespread food shortages and a fast-falling currency. The regime ordered the arrest of opposition leader Leopoldo Lopez after the rioting and violence today.